The walk from Lower Bockhampton to Stinsford is beautiful and, in its own small way, famous. It is beautiful because , although largely a straight walk of less than a mile, for its entire length it follows the banks of the River Frome and is flanked on either side by mature trees. This gives the route a secluded and, at times, almost mystical feel. It is famous because, Thomas Hardy, who was born just up the road at Higher Bockhampton, wrote about it. He included descriptions of an “embowered path beside the Froom” in his early novel, Under the Greenwood Treewhich is set in the fictional village of Mellstock, heavily based on Bockhampton and the surrounding area. 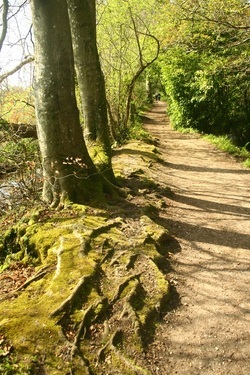 Hardy himself would have used this path on many occasions and lots of locals still do. As it is a public bridleway it is in regular use by horses and ponies and the people of nearby Dorchester. You might think that this traffic would detract from the peaceful enjoyment of this beautiful walk, but if anything it adds to it. The people who use and enjoy the path add to its character and act like a barometer of weather, season and time of day. Sundays the path is still very much a favourite for pre-lunch appetite building or post-lunch constitutional, as families in what now passes for Sunday-best chatter and stroll along this tree-lined corridor looking out over centuries-old water meadows. Other days and holidays the traffic of people will vary in age and activity from joggers and dog walkers to pensioners and horse-riders. And kids, of course, just love it! A tree-tunnel with a river on either side and bridges to play “pooh-sticks” make this a favourite small-person haunt that will exercise their muscles and lungs as well as their imaginations. Keep your eyes peeled for fish and other wildlife too. In this and many other senses too, this path is little changed from when Thomas Hardy and his neighbours would have used it to get to and from the Church at Stinsford or, via walks across the meadows themselves, into Dorchester itself. This was the geography that Hardy knew well and he used it in many of his best works. In that sense it is fitting that whilst his ashes are buried in Poets’ Corner in Westminster Abbey, his heart is buried in Stinsford Churchyard with his first wife Emma. Or at least that is one version of the tale. 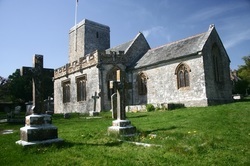 Hardy’s wish was that he should be buried at Stinsford with Emma, but the executor of his estate decided he should be buried at Westminster as befitted a writer of his stature and that as a compromise his heart be buried in Dorset. The alternative version of the story is broadly similar excepting that, having been removed from Hardy, his heart is said to have been left on a table and stolen by a cat. This, so the story goes, prompted an emergency dash to the butcher’s shop by an errand boy for the heart of a pig as a replacement! Whether or not this latter version is true, it does add the sort of twist to the tale that Hardy might have written himself for one of his characters. Many of whom came to sad and sometimes tragic ends, often as a consequence of the bizarre combination of a series of otherwise ordinary events. But there is also an irony that only in death did Hardy truly manage to break through the barriers of the society of his day. Having been born into very humble circumstances he managed to end up buried amongst the greatest of the great and the good - whether he wanted to be or not. One can only hope that the final wishes Hardy created for his Mayor of Casterbridge character, Michael Henchard, were not mirrors of his own. Henchard asked that “no man remember me” and that he not be buried on consecrated ground. Hardy himself is certainly still remembered and celebrated for his genius and is buried not once but twice on consecrated ground, in London and again in Stinsford’s simple country Church a few miles from the place he was born and that shaped him and his work. 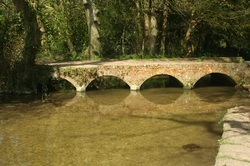 The walk from Bockhampton to Stinsford and back can be enjoyed without knowing anything of Hardy or anything of his work. But for those who have the slightest interest in the great Dorset author, the extra few yards that take you from the riverside walk to the Churchyard at Stinsford are well-worth the effort. All good walks, like all good stories, should have a beginning, a middle and an end. 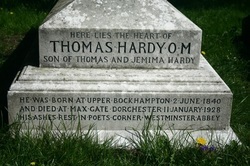 A visit to Bockhampton provides all three and for those who know the story of Thomas Hardy the extra twist is that you can visit where he was born and his chosen final resting place in an afternoon. A journey of a few miles in a lifetime and a journey of a lifetime in a few miles. Hardy himself would have used this path on many occasions and lots of locals still do...​"